Lucrezia’s Family: The Renaissance Borgia Dynasty. Much maligned for their misuse of power, the Borgias are being reassessed in our age of more secular power politics. Were Alfons (Pope Callixtus III), Rodrigo (Pope Alexander VI), Cesare and Lucrezia dastardly characters or stereotyped as Machiavellian? Were the Borgia popes abjectly sinful or merely worldlier than was good for their reputations? 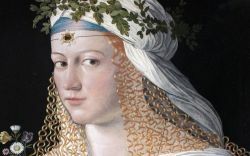 Was Lucrezia one of history’s great vixens or her powerful family’s pawn? Were the Borgias simply victims of early biographers intent on character assassination due to gender politics or a poor understanding of how political power must always be used? Our program reexamines the Borgias in the context of their considerable contributions to the Italian Renaissance. This program is offered with the support of the College of Letters and Science, UC Santa Barbara.